A proper follow up post to the 50 easy soup recipes is a very comforting Broccoli Cheddar Soup! There can never be enough soup recipes at our fingertips, and this classic is no exception. Albeit it’s full of cheesy goodness and a touch of cream, I wouldn’t call this healthy, but it does have tons of broccoli, which is great! I do believe in comforting food can be healthy for our hearts on occasion, and that is exactly why I made it. 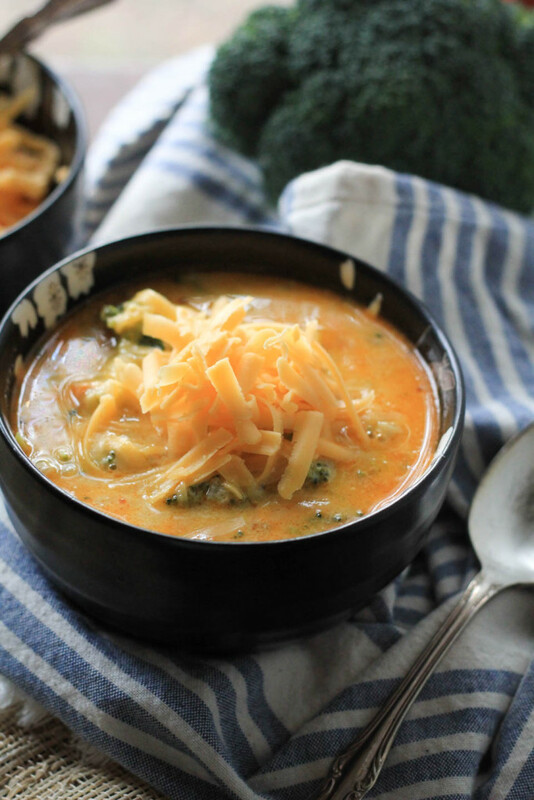 It was super cold and rainy for the last week and I wanted comforting soup, and I’ve been working on this recipe, which came at a good time once I got the recipe where I wanted it. It was the simplicity of paprika, cooked with the onions and garlic before adding the liquid. Cooking spices in oil or butter to “bloom” the spice changes the favor and makes it more fragrant. In this case it made the soup perfect, a bit smoky, and exactly what I wanted. Cheddar gooey goodness all warm in a bowl with a nice chunky bread is simple, and simple is something I am all for. When things seems overwhelming, too much going on, feeling stressed, or just too much on your plate, turn to a warm bowl of old school soup. It makes all the difference in the world. And that is why this post is short and sweet :). In a large dutch oven or pot, add butter over medium heat, once butter is melted, add flour. Stir to combine and cook over medium heat for 7 minutes until golden brown, stir occasionally. Add onions and cook for 7 minutes, stirring occasionally. Add garlic and paprika, cook until fragrant, about 2 minutes. Add stock, milk, fine sea salt, and black pepper, using a whisk, whisk to combine. Bring to a boil over medium high heat, reduce to a simmer over medium heat. Add broccoli and carrots. 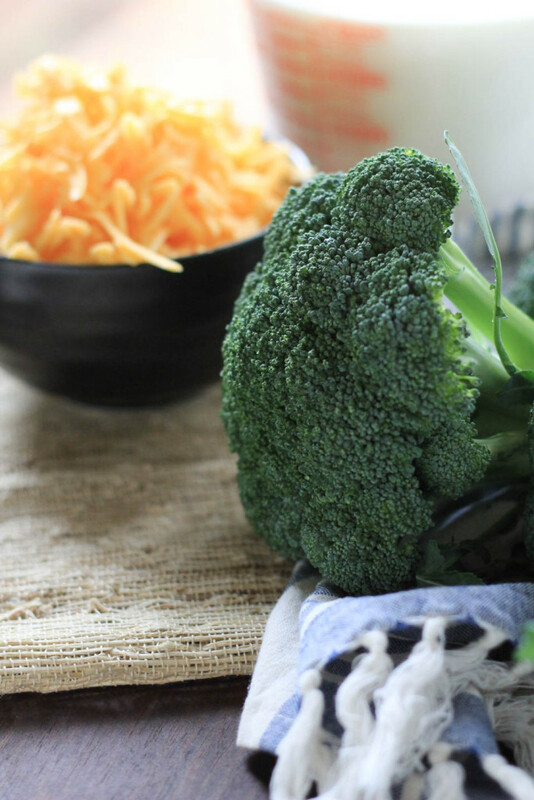 Cook over medium low heat for 20 minutes, or until broccoli is bright green and tender. Turn off heat, add 3 cups cheese, stir in to combine. Serve immediately with a sprinkle of cheddar cheese. Store leftovers in an airtight container for up to 3 days. What a beautiful, hearty bowl of homemade soup! I could just do with a bowl right now as I’ve been struck down with an ear infection and am struggling to manage “real” food! Can’t believe this is so quick to make as well! You know, I make cream of broccoli soup all the time, and love broccoli and cheddar, but have never made it! What is wrong with me? Thanks for the awesome reminder! 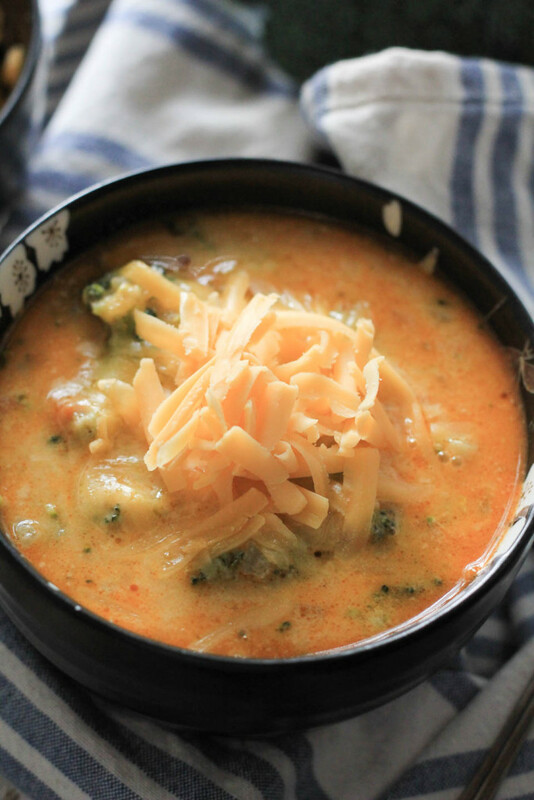 I love creamy vegetable-based soups and this is one of my all-time favorites!